Build solid mathematical understanding and develop key conceptual connections. The inquiry-based approach integrates the MYP key concepts, helping you shift to a concept-based classroom and cement mathematical comprehension. 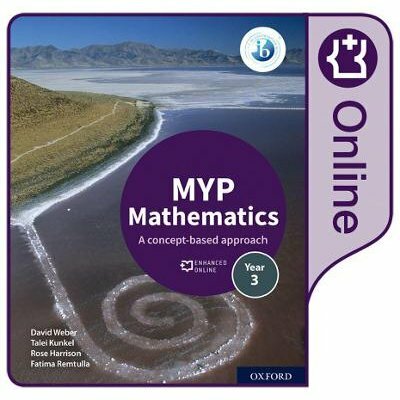 Fully comprehensive and matched to the Revised MYP to support achievement. Progress your learners into IB Diploma - fully comprehensive and matched to the MYP Next Chapter curriculum Develop conceptual understanding in the best way for your learners - learn by mathematical unit or by key concept Drive active, critical exploration of mathematical principles - build rounded comprehension framed within the key and related concepts Develop meaningful cross-curricular connections that help learners recognize and manipulate mathematical ideas in other disciplines Support higher level thinking skills through an approach grounded in factual, conceptual and debatable questions Build a solid foundation of practical skills with extensive practice equipping learners to apply skills Fully prepare learners for the MYP eAssessment The online Student Book will be available on Oxford Education Bookshelf until 2028. Access is facilitated via a unique code, which is sent in the mail. The code must be linked to an email address, creating a user account. Access may be transferred once to an additional user.